over a large part of Southcentral Alaska . . . [Other] ports were wiped out. Only the Port of Anchorage was partially operational after the earthquake." Continued from the last page . . .
After visiting the air museum and watching float planes take off and land at Lake Hood this morning we drove a couple miles northwest to the parking area for Earthquake Park, which lies along Knik Arm on the coastline. 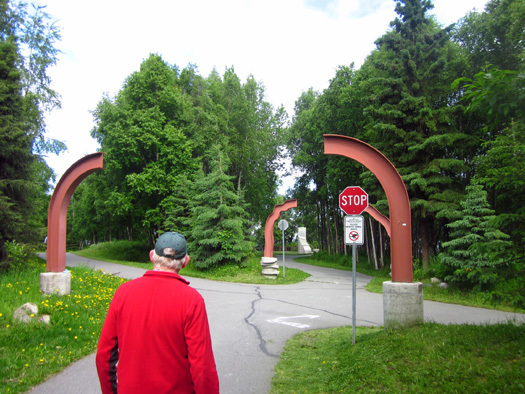 We got to see part of the popular paved Tony Knowles Coastal Trail (bike and walking path) and several interpretive panels re: the Good Friday earthquake and tsunami that devastated parts of Southcentral Alaska in the spring of 1964. Jim approaches the Coastal Trail. 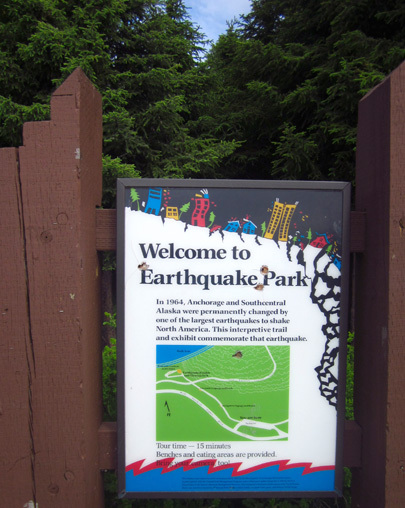 The path ahead of us leads into Earthquake Park. 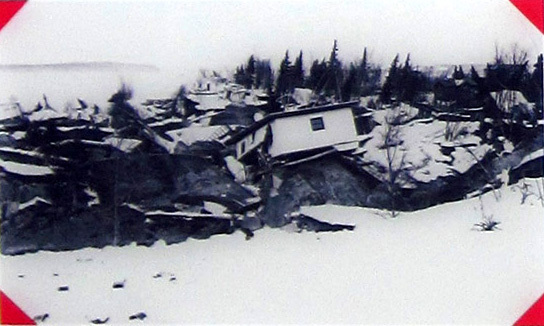 Jim and I were teenagers in the Midwest when southern Alaska was hit with that massive quake, which registered a whopping 9.2-magnitude on the Richter Scale. Neither of us remembers anything about it from back then but we've heard about it over the years and read more when we were researching our trip to Alaska. 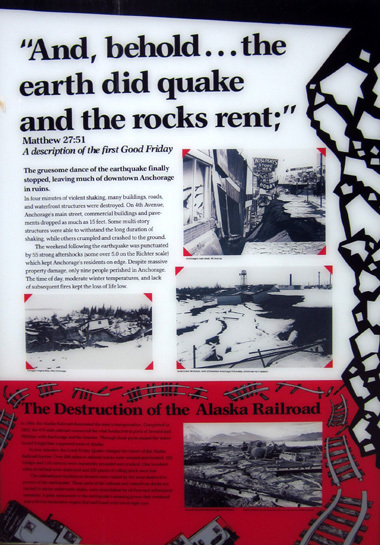 Last week in Valdez we got a big dose of the history of this quake. That town was completely destroyed during this event and subsequently rebuilt four miles away. We visited the old townsite and couldn't help but feel compassion for the folks who were directly affected by the disaster. Note the zigzag pattern in the walkway in this photo and another one farther below. The jarring lines and the jagged stone sculpture depict the damage done by the earthquake. The earthquake wasn't the worst of it that day, however. It was 40-foot tsunami waves caused by the quake that caused the most damage and loss of life in both Valdez and Seward. 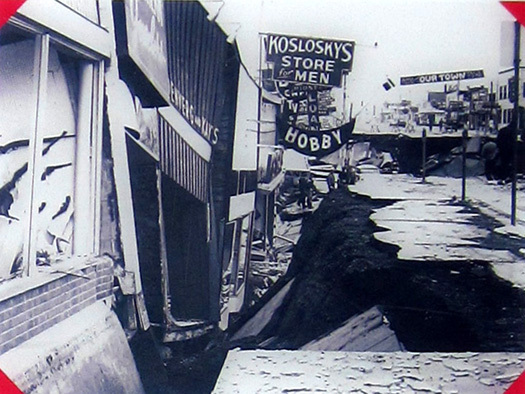 Other coastal cities like Kodiak, Cordova, and Whittier were also severely damaged. They suffered the complete loss of their ports and adjacent fishing, railroad, and industrial facilities. The loss of the ports in Valdez and Seward in particular was crippling, as these were the only all-weather, ice-free ports with road and rail access to Interior Alaska. The destruction of these ports permanently changed the economic pattern of water and rail transport in the state, bringing major shipping to Anchorage. In contrast, Anchorage suffered more damage from the earthquake than from tsunami waves, despite being surrounded on three sides by the water in Cook Inlet and its two "arms," Turnagain Arm and Knik Arm. 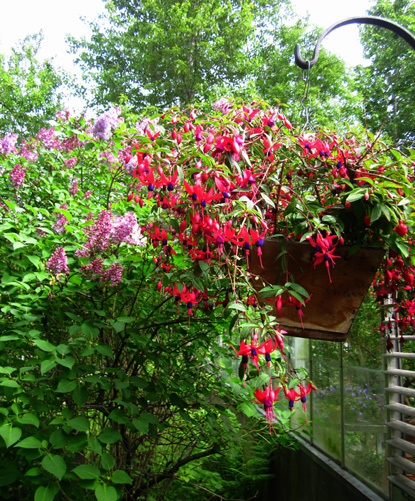 In this entry I'll talk a bit more about Earthquake Park and show you photos from the city greenhouses, the source of many of the lovely flowers displayed throughout Anchorage every summer. 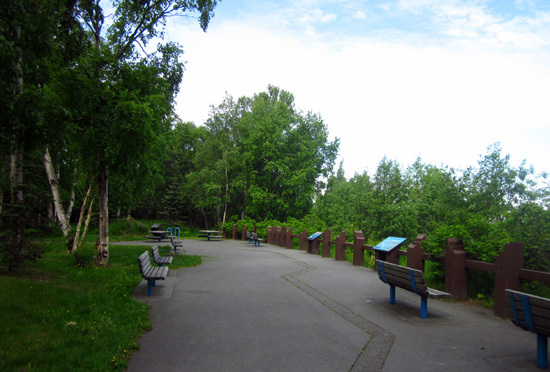 Earthquake Park is one of the most popular places in Anchorage to view Cook Inlet and the Alaska Range. Low clouds on the horizon hide the Alaska Range. On a clear day 20,320-foot Mt. McKinley (AKA Denali) and 17,40-foot Mt. Foraker are visible to the north. It was too cloudy to see them today. 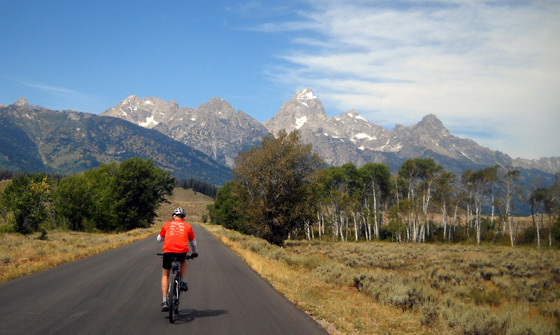 We�re hoping for a sunny day soon so we can see the inlet and mountain ranges to the west and north from this location and other parts of the bike trail. 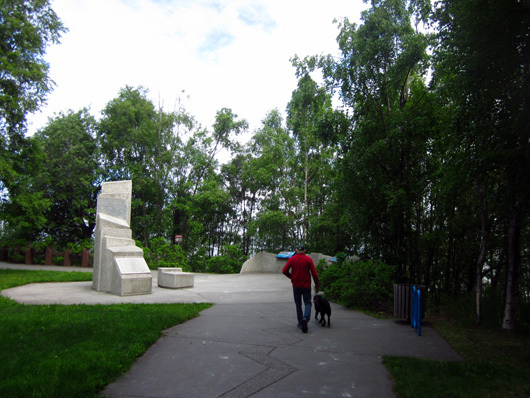 Today we read the interpretive panels and enjoyed having the small grassy park mostly to ourselves. Note the "You Are Here" arrow at the bottom left of the picture above. 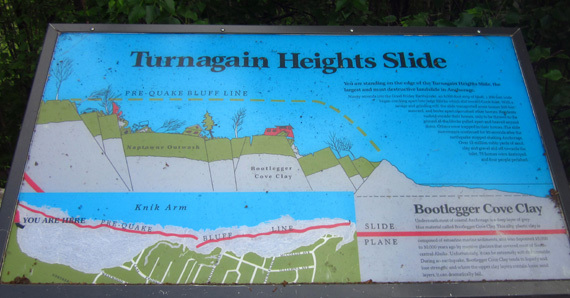 An 8,000-foot strip of the bluff, 1,200 feet wide, cracked and slid toward Knik Arm of the Cook Inlet, destroying 75 homes and killing four people as the earth gave way. Much of downtown Anchorage was ruined. Although there was extensive damage to roads, buildings, and water and sewer lines in Anchorage, the city fared better in some ways than Valdez and Seward. Fewer people lost their lives. There weren't any large fires. And the airports were operational within a few hours after the disaster, aiding rescue efforts. One interpretive panel shows ways that buildings in Anchorage are now constructed to better withstand earthquakes. 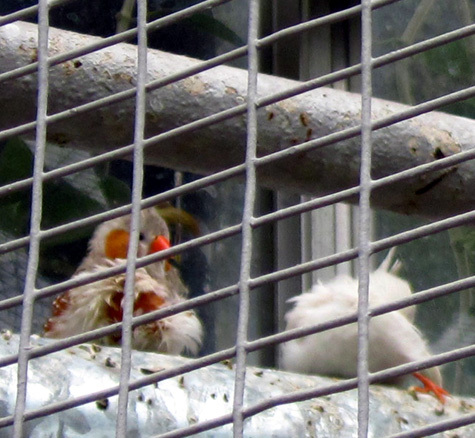 Another describes the damage to the flora and fauna from the quake and tsunami. Other panels are non-quake related. 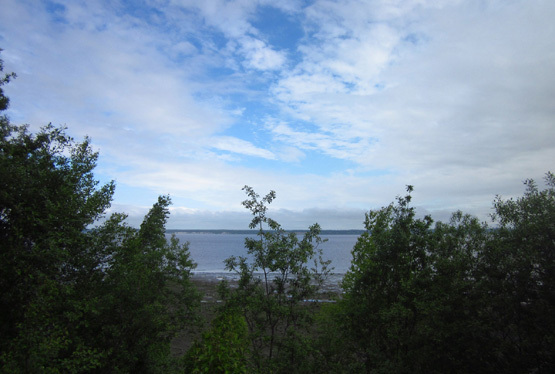 They describe a nearby wetland, wildlife in the area (including beluga whales, which travel through Cook Inlet), the different types of Pacific salmon (five types, each with an alternate name), the surrounding mountains, and other information about Anchorage that we found interesting. This is a very nice little park. Go see it if you're in Anchorage. 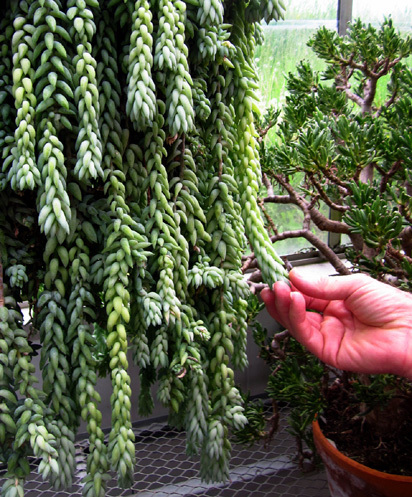 Another stop we made today was at the Mann Leiser Memorial Greenhouse and horticultural complex in the unit of Russian Jack Springs Park that is located on the south side of DeBarr Rd. 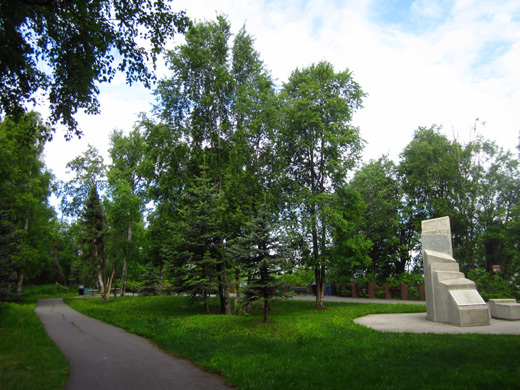 (the other part of the park is on the north side of DeBarr). 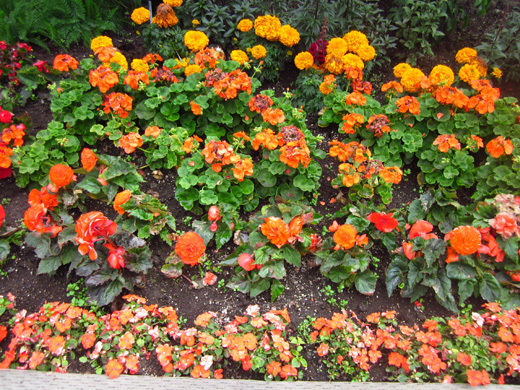 The city maintains this large horticultural complex to supply a profusion of beautiful flowers and other plants in the summer. It is part of the Parks and Recreation Department. 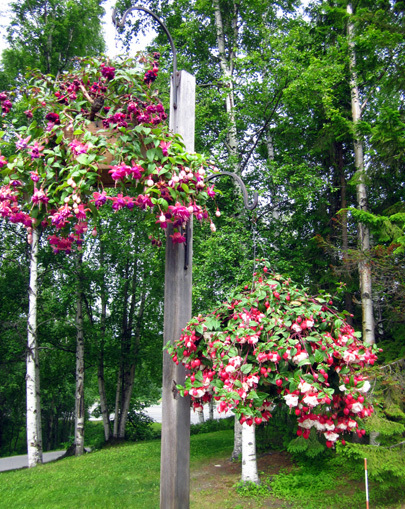 According to the website link city workers planted and are maintaining 461 flower beds and hanging baskets with more than 76,000 annual flowers and other plants at 81 different sites to brighten Anchorage this summer. 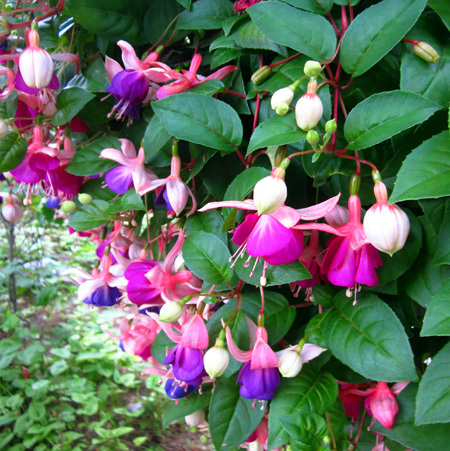 is full of exotic fuchsia flowers. 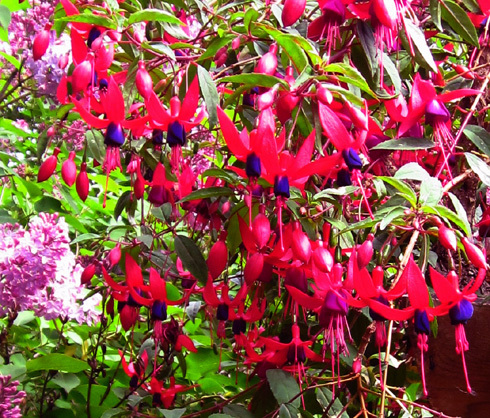 A fragrant lilac bush blooms in the background. Ahhh . 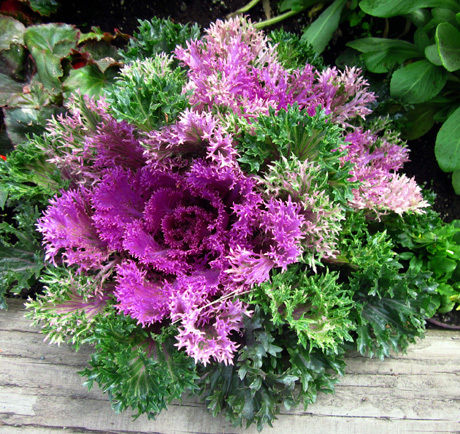 . .
We�ve been admiring gorgeous flowers all over the downtown area this week. 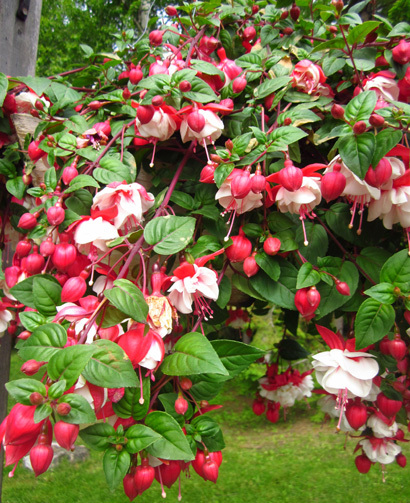 They're in baskets hanging from lampposts and in beds along sidewalks, in the street medians, at intersections, and throughout 200+ city parks. 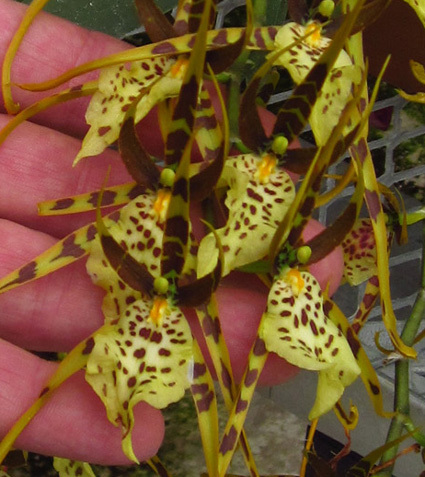 We didn't see what we expected to see at Plant Central -- more flowers like those we've seen around town, growing in the greenhouses, ready to be planted in other places or to replace ones that die or get damaged. We didn't see the whole complex, however. 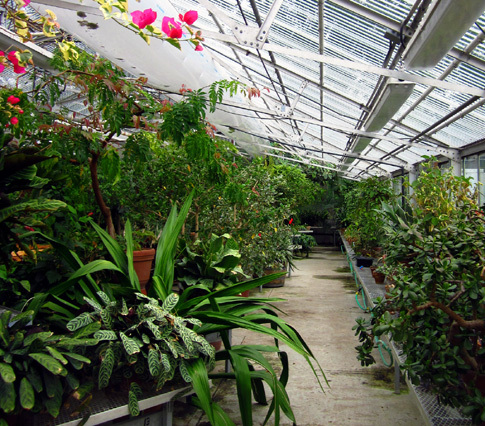 There are a total of six greenhouses used to grow all the plants. 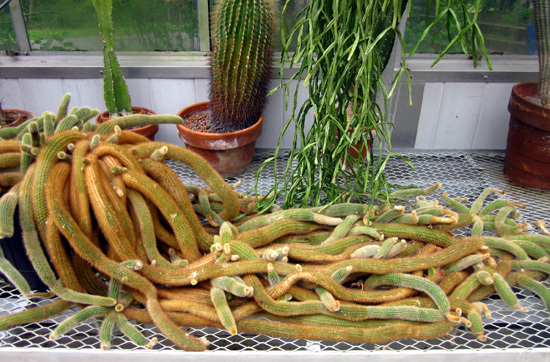 Signs on two empty greenhouses we saw near the visitor parking area said �employees only� so we followed a path around to the building that displays numerous tropical plants and cacti -- the Mann Leiser Memorial Greenhouse. That's apparently the only building visitors may tour on their own. 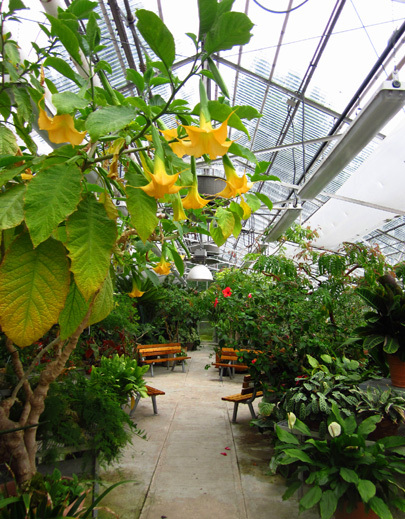 The memorial greenhouse is open most days of the year from 8 AM to 3 PM and is free to tour on your own. Volunteers also provide some guided educational tours. We enjoyed our visit and recommend it to others. You can easily spend an hour here. 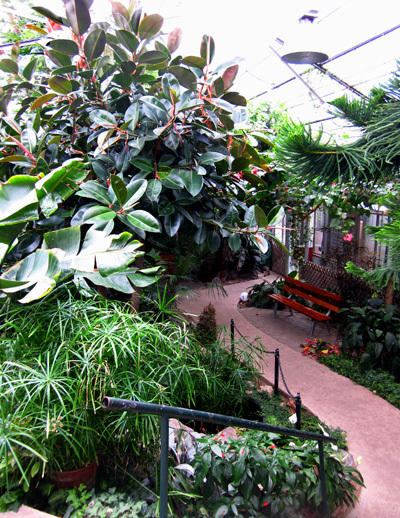 In addition to all these greenhouses the horticulture department also tends to a landscape material nursery with over 6,000 trees and shrubs. 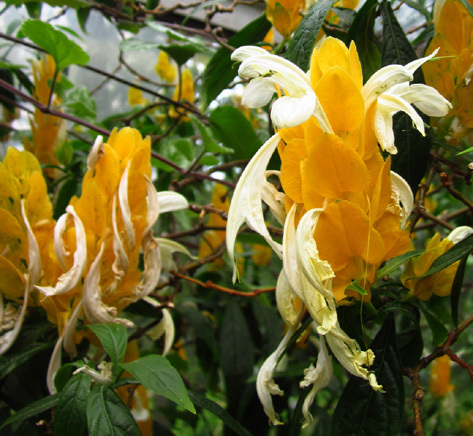 Workers maintain 179 tree/shrub sites around town, mow and fertilize turf at 96 sites and along 79 miles of streets, and keep all the flowers, trees, shrubs, and grass irrigated at those sites throughout the summer. We've already seen some of them at work in front of the Old Federal Building on 4th Ave. I know visitors appreciate what they do. I hope the taxpayers don't mind paying for it! 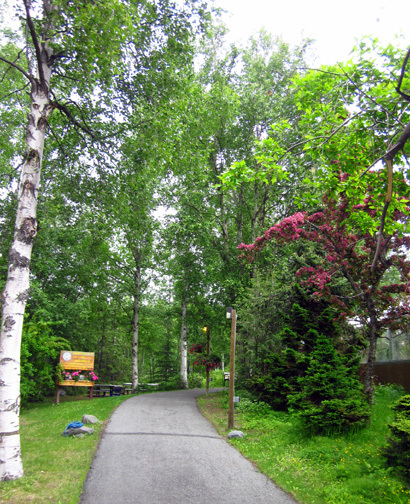 Anchorage is a more inviting place to live and visit because of the municipality's extensive landscape and beautification efforts. 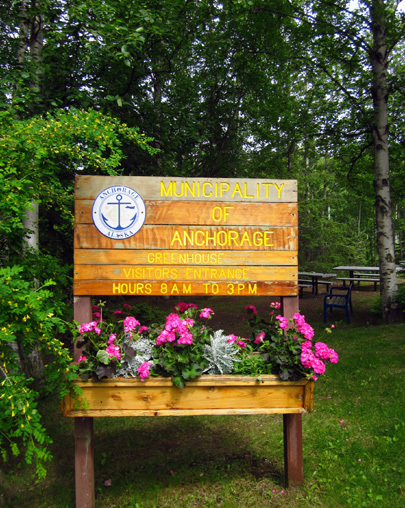 We had one more attraction on oury agenda for today (more than that would have worn us out) -- the Alaska Heritage Museum, which showcases numerous Native Alaskan artifacts and fine art. I'll show you pictures from it in the next entry.